Clark Ashton was born in Augusta, Georgia in 1958. He began welding in 1975, and worked as a welder until moving to Atlanta in 1978 where he toiled for wages. 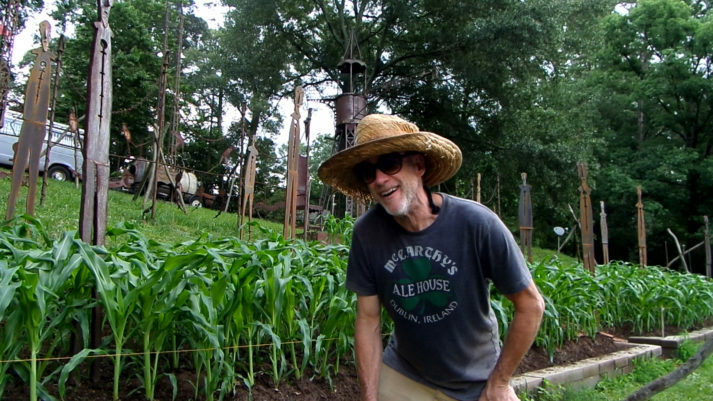 He began creating metal sculpture in his backyard in 1989 with no formal training in art. Meanwhile he earned a B.A. in Anthropology and followed with an M.F.A. in Sculpture at Georgia State University. He received Individual Artist Grants from the Georgia Council for the Arts in 1991 and 1994, and from the DeKalb Council for the Arts in 1992, 1995, and 1999. His work has been displayed in numerous regional and national exhibitions. Ashton has taught sculpture at The Georgia Institute of Technology, The University of Tennessee at Knoxville, and The State University of West Georgia. His work also includes painting, video, and performance elements. He is a 2017 Atlanta Artadia Awardee. Clark joins Artadia for a brief discussion about his work. You were born in Georgia and have lived in the Atlanta area for decades. What do you love about Georgia? What effect has the Atlanta arts community had on you? What’s not to love? Backroads, cemeteries, old iron-working tobacco farmers, soul music. But I was born with wanderlust. As a 12 year old in Augusta, I would take maps and trace out the road trip I was going to take, going everywhere. The names of all the cities were intoxicating to me. I never intended to be in Georgia all my life. At 20, Atlanta was just the first stop on an open road ahead. Here, a migrant girlfriend introduced me to her art life. I didn’t really anticipate evolving into a practicing musician or a full-time artist. One day I just woke up and said: This is what I am going to do. At first, I didn’t really see or become involved with an “arts community,” that was too far outside of my “self,” too beret and thumb, as distant as the golf shirts in Augusta. I couldn’t call myself an “artist,” I was just blue-collar party fun, strumming and singing along. It was regular working people here and there with whom I connected. Some made music, others art, nursing students, carpenters, all part-time dreamers. It wasn’t until I went to GSU that I found an “arts community” that I could relate to. Not just students, but artists of all ages bursting with creative energy. I love those people and remain great friends with many of them. But I often regret that I never got away. The fact that I spent too much time in one place remains a hangnail. But I do take my big van on road trips every chance I get. And staying in one place allowed me to unexpectedly create something bigger than my dreams, while I still chase others. If geography is capable of such things, I guess Georgia helped shape who I am. But there are lots of different kinds of people here, and an Applebee’s too, so to say that is a romanticized and deceptively limiting analysis. Memories of the Savannah River, the mountains, Stove Parties and Corn Parties on Druid Hill with old friends are priceless. Playing music in Atlanta is one of my life’s greatest joys. But I love doing that anywhere . When you first starting making sculptures in 1989, you had no formal training. Later on, you received a BA in Anthropology and an MFA in sculpture. Do you think this initial lack of an art education affected how you approach your work? Does anthropology inform your work? No doubt about it on both counts. I didn’t feel the pressure to perform as an “artist.” I could just pretend, like a costume party. There was no failing, no critiques, no burdensome need for abstraction or cleverness, it was all just for fun. I learned that if I just let the work flow, it would find itself. I am genuinely surprised at the degree to which my stories wrote themselves around it. I suppose you could say it was in my subconscious waiting to come out, but that’s not an adequate explanation. I tend to think that it’s hybrid experiential, where my past and/or inner self informs my present, and combines with the need I feel to make stuff. I discover new ideas while in the process, and then after the work is done, I know with full clarity what it all means. And I just love it when that happens. So I approach my work fearlessly. There are no mistakes. There is no rush to finish it. It’s done when its done, once I’ve used up all the paint.All my previous schooling had been technical, welding and electronics, those were my curiosities, plus they would get me a job and out onto the road map I had traced. So when I went to college at 30, it was to satisfy my mind, not to get a job. I wanted to know why people think like they do, believing unbelievable stuff and doing unbelievable things based on those beliefs. I saw a “Belief Systems” course in the Anthropology program, so that’s where I started. That education gave me a new basis for starting to understand more about the human condition. It has been invaluable in my growth as a person, an artist, and a citizen trying to navigate the intricate and often convoluted web of life. Tell us about the Mechanical Riverfront Kingdom on Druid Hill. When I bought the property in 1984, I liked the difficult access hilltop because I wanted to build a music studio and didn’t want my things to get stolen. I bought a piano and built a brick BBQ grill. I called it Clark’s Burgers and Tapes. In 1989, frustrated with creative compromises inherent in musical endeavors, I decided to start making sculpture. My sloping yard to the street created a natural stage. My first idea was to create a big battle on the hill for all the traffic to see. I made some metal men, put them in the yard and started calling it The Commuter Gallery. But I didn’t build “the battle.” Over the next 25 years I built a lot of other things instead; vulture poles, sky saws, a Superstructure.When I built the tower trinity, Faith in Industry in 1996, I incorporated the souls lost in transit into the manufacture of psychic unity that I endeavored, and I identified the road with its endless stream of cars transporting those psyches as The Mechanical River. By this point the sculpture had taken over the backyard as well, and my music had developed into a semi-real thing, and I was starting to make short films so The Commuter Gallery was no longer an adequate moniker to describe all that was going on here.In its entirety, it became the Mechanical Riverfront Kingdom.Then in 2014, for the 30th anniversary of my encampment on the hill, I decided to complete the idea that had kickstarted my art environment: The Battle on the Hill. But conceptually, now it was a much larger battle. Not just a roadside attraction, but a statement about a contemporary civil war, one that pitted our humanity against the forces WE had created that were larger than ourselves, and were now spinning out of our control. Inequality abetted by technology; a seismic shift was underway, a surrender of self that exponentialized the threat to our souls that I had addressed with earlier works. I built 13 empty shells of men, frozen in a desperate last gasp for freedom and salvation. I put up a historic marker to capture the moment. Not the usual government sanctioned “Jessica Lynch” type, but one unfiltered by wealth, power, politics, generals, clergy, or even time itself. This was real-time history; man on the street, a 1st person eyewitness account, as real as it gets. I named it The Battle of Druid Hill. So that’s where my first idea landed 25 years later. I’d come full circle. The Mechanical Riverfront Kingdom is located on Druid Hill Road, a notoriously busy commuter street. In what ways do you consider this transient, anonymous audience when making your work? From Druid Hill, it is to these anonymous drifters on the Mechanical River, from bus loads of school children to funeral processions, that I am able to express my message of freedom and independent thought through symbolic structures, unfettered by others’ agendas. I serve as a “Minister to the Masses” as I consecrate commuters in a morning ritual communique. My annual corn patch is another way I connect with passers-by, who honk and wave when I’m working. People really relate to it, and it helps me convey that I am quite normal despite the enigmatic structures I anonymously ominously present to the public. My art is my life, not something I make to take somewhere else and sell. Like the corn, my art here is organic. I hope it comes across in a positive way…, one day when folks get a chance or take the time to absorb it. It’s funny that I wanted to be on the road, and here I am. What a hoot. What is your artistic process like? What ideas drive your work? My process seems to be one of building ideas on top of each other through multiple mediums, and weaving those mediums together to create a larger whole. The abstract concepts of God and money are the primary underlying influences on my philosophy. I view them as the two most powerful conceptual forces in the history of human culture. But I know that I see them through the lens that is my limited life experience, so I don’t preach, I just reflect what I see and leave it to others to see in it what they will. History has always been a concern, as I have traced and constructed the entire experience of humankind from Adam to the Ascension Machine. Presently, the concept of Druid Hill is what I am trying to explain to anyone that will listen. Druid Hill is a “found earthwork,” to which I have been in service for 34 years. It is a natural geologic formation, and now an artistic medium in and of itself, that I have appropriated like a found object, upon and through which I have integrated multiple mediums to convey a singular cohesive idea that might possibly challenge definition. What’s next for you? How do you envision the future of the Mechanical Riverfront Kingdom? In 2014, I became concerned with how to preserve my environment in my inevitable absence, at the end of the road. I got the idea that putting it on the map was a good start. I love maps. The name to use was never in question. The hill had been the impetus of everything; it gave me a studio for my music and a natural stage for my art. 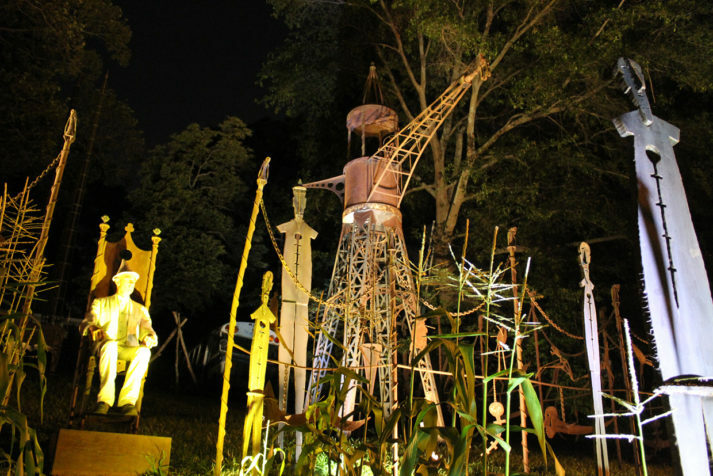 From metal men to psychic unity to corn for my friends, the hill has been essential. So in March of 2017, I applied to the United States Board on Geographic Names to officially designate the land as “Druid Hill.” My Proposal #9150 was opposed by the Druid Hills Civic Association, who lauded their 100 year history and curtly dismissed this land and it’s history as a mere “residential lot with associated yard art” for which I should find “a more suitable name.” I don’t wait for their attitude to evolve. 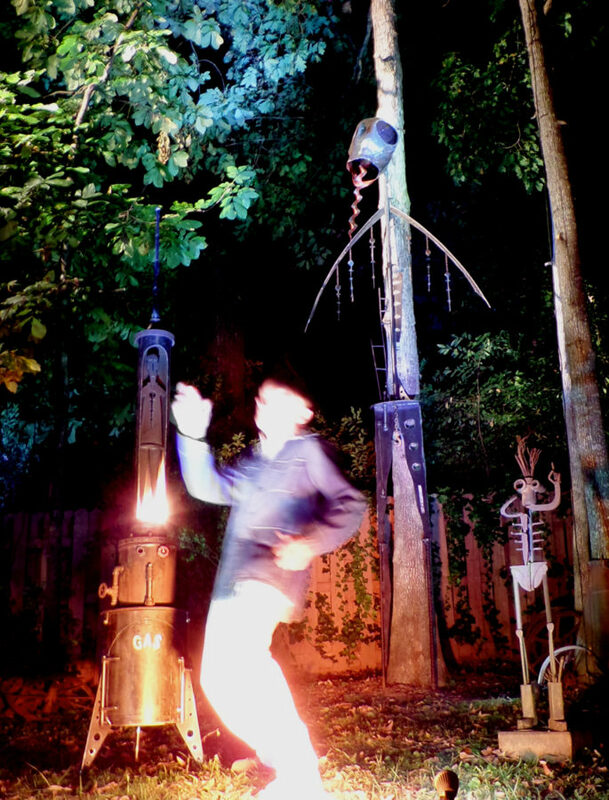 I am out living it every day with my music, my filmmaking, my sculpture, and my writing, as I weave them all together into the singular work that is Druid Hill. The Ballad of Druid Hill is my latest work, a short historical documentary film set to an original song that traces the history of Druid Hill from pre-history to present. My Pillbox #1 and Defension Machine are new sculptural works in progress designed to defend the integrity of Druid Hill. I hope I can find a way to preserve the land and everything that is upon it, intact, for future generations to enjoy. I hope to live here and keep creating until the end. And then have a setup ready where someone can take over and maintain the place. Maybe a caretaker, or an artist-in-residence, a non-profit, or something like that. I’m not an administrative type, so I need help figuring this out. Unfortunately, local government is only interested in protecting the owners of the sun. To help preserve Druid Hill, support Proposal #9150 “Druid Hill,” by emailing Jennifer Runyon at The U.S. Board on Geographic Names: jrunyon@usgs.gov. To see more of Clark’s work, visit his website and his artist registry page. All images of Druid Hill courtesy of Clark Ashton.